Organic jojoba oil (phonetically: ho-ho-ba) is a unique liquid wax obtained through cold-pressing the seeds of the jojoba shrub (Simmondsia chinensis). The plant is native to the Sonoran Desert (Northwest Mexico and Southwest USA). Jojoba shrubs can take up to 3 years to reach flowering maturity from seed. The shrub’s deep root system and leathery leaves make it well suited to droughts and intense heat, even deserts. 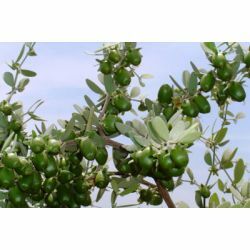 Jojoba is cultivated for its commercially important oil crop, but it is also grown in difficult areas to prevent soil erosion. Jojoba oil is commercially cultivated in Mexico, Israel, Argentina and USA. It is the only natural, botanical substitute for spermaceti oil (obtained from the sperm whale). These types of liquid waxes have hundreds of uses and are very difficult to make synthetically. Whale oil used to be widely utilised across many industries - from lamp oil to soap making. Since the 1970s, pressure has been on to conserve whales and to eliminate the use of whale oil. Native Americans used jojoba seeds and oil for a variety of purposes. They roasted the nuts and ate them when other food was scarce and used the oil to heal sunburn, windburn and irritation; and to condition skin, scalp and hair. Our jojoba oil is cold-pressed, organic, and comes from a plantation located in Northwest Argentina. Brothers Adolfo and Alfredo along with Christian and others have grown the business during the past 20 years. Adolfo and Alfredo started as growers and farmers in the fields and have now developed the plantation into the largest jojoba crop in the world with the highest yield of oil. Jojoba oil is an excellent moisturiser and a softener for skin and scalp, which makes it an ideal ingredient to soften the beard while shaving with our Ambrosia shaving cream. Due to jojoba oil’s affinity with our own sebum, it is more readily absorbed and tolerated by the top layer of our skin. We use organic jojoba oil in our Ultralight hand and body lotion, King of Skin body butter and Dreamtime bath melt, because it is so easily absorbed into the skin. In cases where excess sebum is present, jojoba oil can help to dissolve and clean it away. We use organic jojoba oil in our Rehab shampoo, Godiva and Hard shampoo bars to deeply cleanse the hair and scalp. Jojoba oil is very well suited to conditioning and coating the hair shaft, adding shine and increasing manageability. The Hair Doctor, Jasmine and Henna Fluff-Eaze, and R & B hair moisturisers, and The Big Tease hair gel, all contain organic jojoba oil to condition and give shine. We have also used organic jojoba oil in our Stepping Stone foot scrub to moisturise the skin of the feet without leaving them too greasy.